Sosina Wogayehu learnt to do flips and splits at the age of six, sitting on the floor of her parents’ lounge room in Addis Ababa, watching a German variety show on the only television channel in the land. She sold cigarettes on the streets at the age of eight, and played table soccer with her friends who made money from washing cars, barefoot in the dust. She dreamed of being a circus performer. Twenty-five years later, Sosina has conjured herself a new life in a far-off country: Australia. She has rescued one brother and lost another. She has travelled the world as a professional contortionist. She can bounce-juggle eight balls on a block of marble. Sosina is able to juggle worlds and stories, too, and by luck – she has a friend, David Carlin, who is a writer. Following his acclaimed memoir Our Father Who Wasn’t There, David brings us his ‘not-me’ book, travelling to Addis Ababa where he discovers ways of living so different to his own and confronts his Western fantasies and fears. Through Sosina’s story he shows us that, with risk and enough momentum, life — whom we befriend, where we end up, how we come to see ourselves — is never predictable. David Carlin is a writer, creative artist, teacher and researcher. His creative non-­fiction, essays and articles have appeared in various journals and he has previously written and directed for theatre, film and circus. David is an Associate Professor in creative writing in RMIT’s School of Media and Communication, from where he also co-­chairs the international NonfictioNow Conference, and is co-­director of the nonfiction Lab research group. He is also co-­director of the WrICE (Writers Immersion and Cultural Exchange) program bringing together Australian and Asian writers in collaborative residencies. In 1997 he directed the Circus Oz show in Australia and New York, and since 2008, has led the Circus Oz Living Archive project. David has previously been Artistic Director of Arena Theatre and a founding member of the Red Shed Theatre Company. His plays have been produced at festivals around Australia and internationally. His widely acclaimed memoir, Our Father Who Wasn’t There (Scribe) was published in 2010. 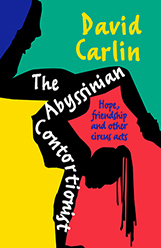 The Abyssinian Contortionist: Hope, Friendship and Other Circus Acts is published by University of Western Australia Publishing (UWAP) and is available from all leading book retailers. For more information, visit: www.uwap.uwa.edu.au for details.